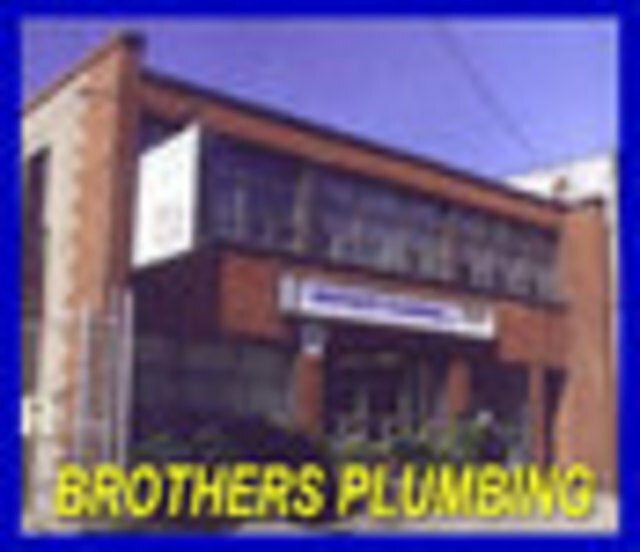 Called brothers plumbing and they managed to come on the same day and were punctual. A bathroom sink would not drain. Patrick helped explain what can cause it and solutions to prevent it from happening in the future. Got it fixed quickly. He is super professional and friendly. Overall: Fast work, and great service. Thank you for your review. We try to see our customers either the same day or at least the next day. We are very happy to hear that your experience was a good one. Thanks again for your kind words. I had my bathroom renovated 3 years ago, Brothers did the plumbing. Recently had a flood in our living room requiring a new ceiling and wood floor caused by faulty plumbing from the bathtub plumbing done by Brothers. I called Brother to see if they guaranteed their work and actually spoke to the plumber did the work. He said he would call me back and never did. I have hired a new plumber to do the repairs. I just got off the phone with someone at Brothers (Oct 16) to talk to them about their reply to this review, they denied that they did the work. A word of advice - do not pay cash. Obviously someone pocketed the money and did not report the work !!!! Also found out that the plumber had cut through joists when the job was done to a point that they need repairing . I think there is some confusion here. We have never done a bathroom reno for this customer. We have done 2 service calls some years ago, a radiator and a pedestal sink. The two plumbers who did those jobs are not with us anymore, so I don't know who he spoke to. We guarantee all our work for one year but have no problems going back to see what has happened and work something out with the customer. I don't know who he spoke to but it wasn't us. Brothers Plumbing is in a class of its own. The team was on time and very Professional. The work they did was top notch! On time was key to finish it on schedule. They also cleaned it all up like as nothing happened in the basement. Thank you for your review. Our goal is to try to have every job to go smooth and within a reasonable amount of time so as not to inconvenience our customers. Happy to hear that this was the case. Thanks again. 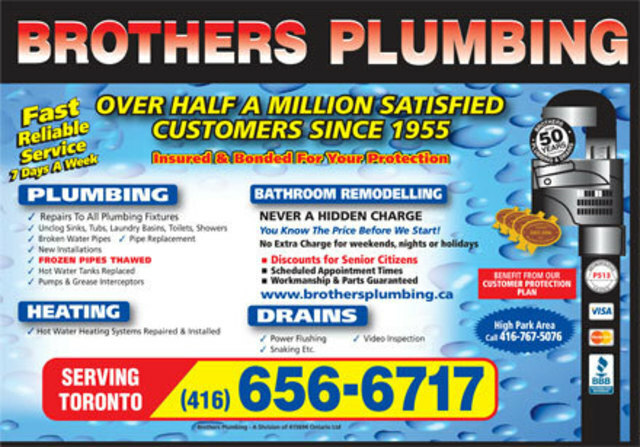 Fast, professional, nice and great prices, thank you David from Brothers plumbing for your services, I called and he was at my home within an hour, fixed my sink so quick, will recommend to friends and family forsure! Thank you for your review. Happy to hear you were satisfied with our service. We depend on your feedback to help us improve our service to our customers. Thank you. After expeirnecing water damage for the first time in our basement, the Brothers came in to install a back-flow valve. They worked with our schedule and would kindly communicate with us about anything and everything we needed to know. I was even able to trust them to lock up my home on their last day of working here. Quick. Easy. Reliable. Thank you! Thank you for your review. We try to make every job as worry-free as possible. When a job goes smoothly everyone wins. Thank you again for your kind words. Not transparent about what the work entailed which resulted in being dramatically overcharged for very sub-par quality work. It was clear the goal was to get the job done as quick and dirty as possible and make as much profit from a young business as possible. Not exactly the type of local business I can support. We signed on for a main drain redo and some additional lines. The work was quoted at 20K for 3 days with 2 guys steady, which seemed very high (and was). In the end it was 2 days with 2 guys and even at that half of each day was spent NOT here or smoking outside. Important to note as well that the only material involved was 15' or so of plastic pipe and another 25-30' of copper pipe. Also, the quality of work and care taken was pathetic - zip ties to hang all piping, plastic drain covers, nothing hung straight to anything else. These are dishonest people just looking to rake you over the coals - take your hard earned money somewhere else! [from below: "we go above and beyond the industry standard for customer satisfaction."] This couldn't be further from the truth - no efforts have been made of any kind here. Thank you for your review. This job was taken with the goal being that it be done in a timely manner. All was done as per contract with no complaints until we reached the payment stage. Now all of a sudden nothing was done properly. This customer was looked after properly and we did all that was asked. Customer asked for the job to be done as quickly as possible but now is complaining we overcharged for the amount of time it took to do.??? Instead of paying what he owes he give us this review. All issues he has are related to payment. Thank you very much. This is the 2nd time I used Brothers Plumbing. Patrick was our service guy this time- very friendly, on-time, clean and all is working fine! What more can you ask for. I'm happy with this company. Thank you for your review. 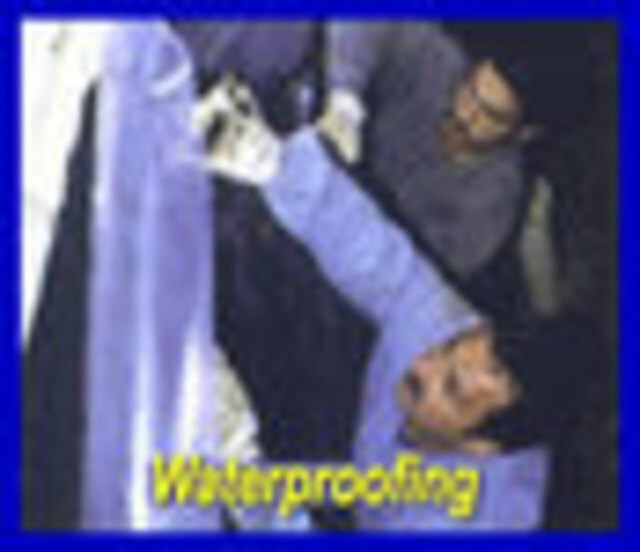 We train all our servicemen to be polite and treat customer's home with respect. Happy to hear you were pleased with our service. Thank you again for your kind words. Thank you for your review. Happy to hear we could service you properly and promptly. We are always trying to give our customers the best service we can in a reasonable amount of time. Thanks again. I called Brothers for leaks in both my bathroom tub and sink faucets. After making an appointment well over a week ahead of time and being told that someone would arrive between 8-10 am, no one came. When I called, I was told that "they forgot that they had given me a time". I was then told that someone would be there between 12-2, Patrick arrived just before 3. I don't blame Patrick, I get the impression that I wasn't on anyone's list for that day and I was squeezed in. Patrick was able to repair my tub faucet and suggested that I replace the tap on the sink. I agreed. I was surprised at the 750 dollar bill, considering that I was given a ball park at $450 (which I was lead to believe was the cost if faucets were replaced, not just the cartridges) Obviously, my fault for trusting a ball park would be accurate. The work was done reasonably well, although it wasn't left particularly clean and Patrick left his outdoor shoes on while working in my tub. At the end of the day, the work was done, Patrick was pleasant, but whoever is taking calls and organizing appointments is not doing this business any favours and the cost just seems like a premium price for mediocre service. Thank you for your review. We try to service our customers within a reasonable time. Unfortunately jobs can be more involved than we expect causing the plumber to be delayed. We are constantly trying to improve our customer service. I called Brothers Plumbing this afternoon at 1:30 and explained that water was pooling around my sink and that my toilet was constantly running and I was hoping someone could come out to take a look. I was informed that someone would be out this evening but I got a call back at 3pm to say that Patrick would be at my home shortly. Patrick arrived within 30 minutes and quickly assessed the problems and fixed both issues. Patrick was friendly and informative explaining to me what the issues were. I would highly recommend Patrick and Brothers Plumbing. 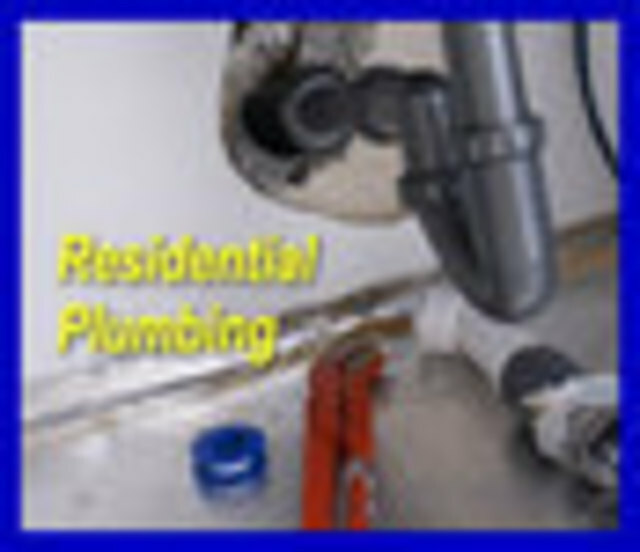 I've used them in the past for various plumbing issues and they have always been timely, professional and cost effective. Thank you for your kind words. We try to service all our customers in a timely manner. We are happy to hear that you got prompt service and were well looked after. Thanks again.